24-7promo’s Steve Harris heads up this department and there are few better people Worldwide that provide the range of specialist services that Steve provides. Inspirational Speaker, runs his own Social Media Workshops and the Creator of Social Media Content. Steve’s expertise in capturing video, editing video and syndicating video to all the Social Media platforms is a big speciality and clients buy in to his expert advice and consultancy services, worldwide. If you’re stuck with a Social Media difficulty not knowing in which direction to go then Steve’s team will break it down and find ABC easy solutions. 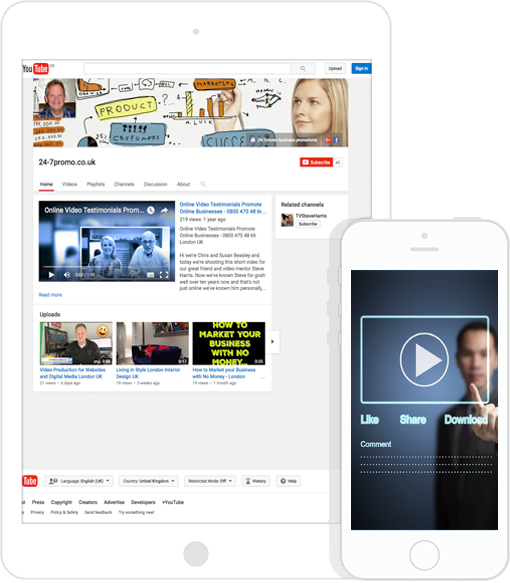 Steve’s skills include Video Upload, Video Presentation Skills, Video SEO and YouTube set-up. It’s not unusual for Steve to WIN 1st page ranking in YouTube and Google within 10 minutes of upload.! Have you got the Know Like and Trust Factor? Steve, is known within his specialist field of expertise around the world, his knowledge of ground breaking software, is key to the successful outcome of clients projects. 24-7promo are integral to all of our clients digital media activity, starting from a new website, to the on and offline promotion and advertising relating to clients products and or services, Steve hand-holds his clients through the whole journey. Steve’s most used quote is “We Don’t Do Normal” preferring to make outstanding content with a huge consistency ethic, in all that he takes on. Steve, can be seen LIVE frequently on Periscope and MeVee as well as many other LIVE broadcasting platforms,his URL handle is TVSteveHarris.